There is a cake sale at the kids school today. I volunteered to help out and then wondered why I did that when really I am pretty philosophically opposed to the whole idea of selling packaged cakes filled with sugar to kids. OK there will be lots of homemade cakes there, but they are probably not going to have zero waste in mind and they are unlikely to be sugar free. I do want to help raise money for the school though and following on from my slow battles blog post the other day (read more here), where I outlined some of mine and other peoples frustrations with the slow life (i.e. everything takes longer and actually life isn’t lived very slowly at all), I was so very tempted to go to a shop and buy something to stick on the cake stand. Grease the muffin pan (I have a sillicon muffin baking thing). 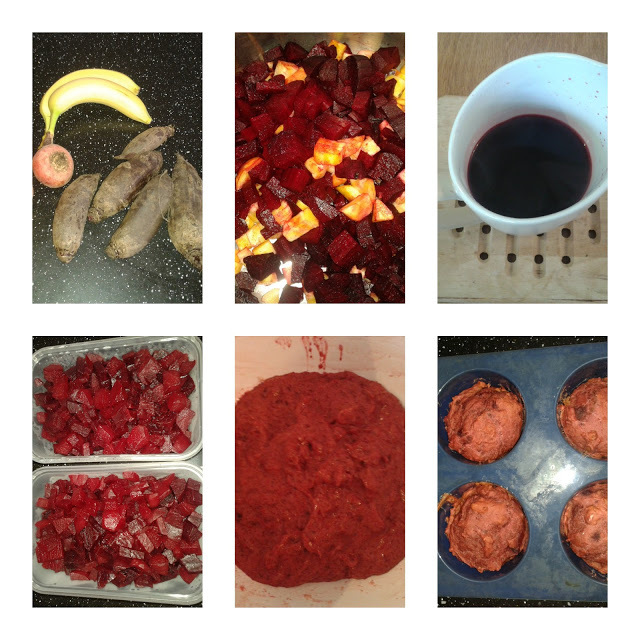 If like me you cooked more beetroot than you actually needed, freeze some in containers to use another day. Cubes of beetroot could be used on salads, on pizzas, in quiches and much more! I shouldn’t have tasted them, but I did (as I generally try to avoid grains). They tasted ok – a bit doughy, but other than that quite nice and you can really taste the ginger in them! I have no idea what the kids will think – hope they like them! This entry was tagged dairy free, Food, nut free, recipe, sugar free, sweetener free. Bookmark the permalink. Let me know what you think! If I was making it again I would put less flour in and less ginger in. I liked the ginger but it was a bit too spicy for the kids!